The number of building permits issued in DeSoto County in 2012 grew by more than 60 percent over the previous year, and that’s good news for growth in the year ahead, DeSoto County Director of Planning Ted Garrod told DeSoto County Supervisors on Tuesday. Garrod said there were a total of 730 single family residential permits issued in 2012 compared to 456 in 2011. Garrod said there were 48 issued in the month of December alone. 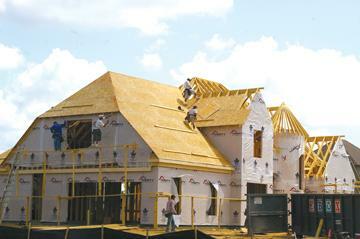 Unincorporated DeSoto County recorded the most building permits with 229. Southaven led all cities with a total of 214 permits, followed by Olive Branch with 138 and Hernando with 122. Horn Lake recorded 21 and Walls issued six building permits for single family home construction. DeSoto County Planning officials said it’s unlikely DeSoto will ever see again the flurry of building activity which the region saw during the boom years of home construction. The high watermark for home construction was in 2005 when there were a total of 2,802 building permits issued. In 2008, after the effects of the Great Recession, building permits dropped off significantly and have only recently begun to rebound. Board of Supervisors President Mark Gardner welcomed the good news. DeSoto County Administrator Vanessa Lynchard agreed.